The Texas Asbestos Health Protection Rules, implemented on October 26, 1992 amended September 22, 1994, has increased the responsibility and liability for asbestos containing building materials to building owners. This liability is for any buildings that are “subject to public occupancy, or to which the general public has access” and states that “The owner retains the primary responsibility for the presence, condition, disturbance, renovation, demolition, and disposal of any asbestos.” In addition, the Rules stipulate that prior to any renovation or demolition, the building must be inspected for the presence of asbestos by a licensed asbestos inspector and except in cases where only limited amounts of asbestos is present, the removal project for the asbestos must be designed by a licensed asbestos consultant. Astex Environmental Services a licensed asbestos consulting agency with all associated personnel being fully accredited and licensed in various disciplines: asbestos inspections, abatement project managers, project designers, and air monitors, by the State of Texas under the 1994 Texas Asbestos Health Protection Act, (Texas Civil Statues, Article 4477-3a). INSPECTIONS: Inspections include a review of available building specifications, blueprints, as-built specifications, etc. to determine if suspect materials had been called for; full physical inspection of all areas of a building including tenant areas, mechanical areas, roof systems, common or public areas, etc. ; identify suspect materials and take an adequate number of bulk material samples in order to obtain definitive results in determining the presence or absence of asbestos; quantify the suspect materials and record the condition of same; identify damaged areas of concern; review and evaluate the results of sample analysis from an independent laboratory and fully incorporate all of the above in a clear, concise, easy to understand report with costs and recommendations. Asbestos Inspections can typically be scheduled within 24 hours, with lab results and report available within 3 days of the inspection. Costs start at $195 and increase based upon the number of samples needed. MANAGEMENT: If positive asbestos containing materials are identified (either by us or other consultants), we are available to prepare a comprehensive Operations and Maintenance Plan (O&M) for the management of the material in place to include the necessary maintenance personnel training. Additionally, we are available to perform routine O&M re-inspections. ASBESTOS ABATEMENT: If the asbestos is to be removed or repaired, we are available and licensed to write abatement work plans, prepare bid documents, and work, on the client’s behalf, in obtaining competitive bids from licensed abatement contractors for the removal of the material. We have the expertise and personnel to supervise the abatement project from the initial notification of regulatory agencies to the transport and burial of the contaminated material in an approved landfill. 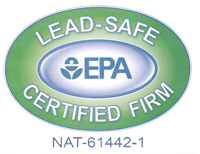 We are a state licensed laboratory for analysis of asbestos air samples and adhere to the American Industrial Hygiene Association’s (AIHA) quality assurance/quality control program.